The anomalous concentration of radiocarbon in 774/775 attracted intense discussion on its origin, including the possible extreme solar event(s) exceeding any events in observational history. Anticipating such extreme solar events, auroral records were also surveyed in historical documents and those including the red celestial sign after sunset in the Anglo-Saxon Chronicle (ASC) were subjected to consideration. Usoskin et al. (Astron. Astrophys. 55, L3, 2013: U13) interpreted this record as an aurora and suggested enhanced solar activity around 774/775. Conversely, Neuhäuser and Neuhäuser (Astron. Nachr. 336, 225, 2015a: N15a; Astron. Nachr. 336, 913, 2015b: N15b) interpreted “after sunset” as during sunset or twilight; they considered this sign as a halo display and suggested a solar minimum around 774. However, so far these records have not been discussed in comparison with eyewitness auroral records during the known extreme space weather events, although they were discussed in relationship with potential extreme events in 774/775. Therefore, we reconstruct the observational details based on the original records in the ASC and philological references, compare them with eyewitness auroral observations during known extreme space weather events, and consider contemporary solar activity. We clarify the observation was indeed “after sunset”, reject the solar-halo hypothesis, define the observational time span between 25 March 775 and 25 December 777, and note that the parallel “drawing of lunar halo display” in 806 in the ASC shown in N15b was not based on the original observation in England. We show examples of eyewitness auroral observations during twilight in known space weather events, and this celestial sign does not contradict the observational evidence. Accordingly, we consider this event to have happened after the onset of the event in 774/775, but to have shown relatively enhanced solar activity, with regard to other historical auroral records in the mid-770s, as also confirmed by the 10Be data from ice cores. H. Hayakawa is JSPS Research Fellow. We thank Corpus Christi College (the University of Cambridge), the British Library, the Fitzwilliam Museum (the University of Cambridge), and Staatsbibliothek zu Berlin (SBB) for providing the images and the permissions of research of the manuscripts of Anglo-Saxon Chronicle, those of Anglo-Saxon coins, and those of Annales Laudensis et Sancti Vincentii. We gratefully acknowledge L. Cowley for providing HaloSim 3, R. Naismith for his advice on the contemporary coinage, A. Popescu for permission of photographing Anglo-Saxon coins in the Fitzwilliam Museum (the University of Cambridge), D. Hooper for advices on atmospheric optics, the archivist in SBB for his permission of reproduction and advices on precise referencing of the MS Phillipps 1830, Y. Okada for his help on accessing German documents, S. Kikuchi for his advices on the Carolingian military systems, the Carolingian manuscripts, and medieval Latin dictionaries for the Carolingian territories, N. Ebihara for her comments on our philological interpretation on the Old English texts, K. Nakada for his advice on the medieval European military systems, and T. Hoshi for providing calculation code for sunset and sunrise. This work was supported by the UKSSDC, a NSF grant ANT-1643700, and a Grant-in-Aid from the Ministry of Education, Culture, Sports, Science and Technology of Japan, Grant Number JP18H01254 (PI: H. Isobe), JP15H05816 (PI: S. Yoden), JP15H03732 (PI: Y. Ebihara), JP16H03955 (PI: K. Shibata), and JP15H05815 (PI: Y. Miyoshi), and a Grant-in-Aid for JSPS Research Fellows JP17J06954 (PI: H. Hayakawa). MS F Latin: The sign of a cross was seen in the heaven after the Sun’s setting. Transcription: 772…, in coelo signum dominicæ crucis post solis occasum, et ipso anno bellum ciuile gestum est inter Cantuarium populum et Merciorum in cognominato loco Ottanforda. Translation: 772…the sign of the Lord’s cross appeared in the sky after sunset, and in the same year civil war was waged between the people of Kent and that of the Mercians in the place called Otford. Transcription:  (vi) 796 Rubicundi coloris signum in crucis modum in celo apparuit post solis occasum. Translation: A red sign after the fashion of a cross appeared in the sky after sunset. Transcription: …Hoc autem anno uisa fuerant in celo rubea signa post occasum solis…. Translation: …In this year, however, red signs had been seen in the sky after sunset…. As shown in the Section 4.1, the sign of Christ and the sign of cross are not restricted to the vertical cross. Lenker (2010, p. 263) enters a caveat on its interpretation: “interpretation of cristes mæl as the ‘cross’ requires the ideas stressed by Ælfric3 […] that the holy rood is a sign for Christ. Without this interpretative support in a theological background, cristes mæl could, for instance, also denote baptism (cf. German Christusmal ‘baptism’ in theological discourse) or be taken to refer to the stigmata of Christ (cf. German Wundmal)”. Indeed, in one of the Old English charms recorded in a medical text called Bald’s Leechbook in a 10th century manuscript, “[t]he author seems to distinguish in meaning between Cristes mæl and cruc [Old English word for a cross]” (Bremmer 2010, pp. 213 – 214). In this text, it is commanded that Cristes mæl should be made on every limb, which might symbolise the wounds Christ suffered on the cross (stigmata). In short, our “red sign of Christ” could also be his stigma, with blood flooding from it, hence red. Meanwhile, the majority of the examples of Cristes mæl and its variant cristelmæl attested in Anglo-Saxon sources did mean the sign of the cross and some scholars attribute this meaning to the celestial sign (Lenker 2010, p. 266, n. 91). Nevertheless, a cross itself can take various forms too. Etymologically speaking, Greek “stauros primarily means ‘stake, pole’ and, by extension, any kind of elevated structure on which criminals were executed, including the time-honoured representation of the cross, but also, for example, the chi-shaped cross X, on which the apostle Andrew allegedly suffered his death, and the tau-shaped cross T” (Bremmer 2010, p. 205). Also, “The Latin word crux, too, originally had little to do with our word ‘cross’, but signified, like the Greek stauros, a ‘pole’ or ‘stake’ ” (Bremmer 2010, p. 206). Anglo-Saxons recognised crosses with various shapes as well. The Old English word rōd again “originally signified ‘pole’ or ‘stake’. As such, it semantically parallels Greek stauros and Latin crux, something that Ælfric, for example, was well aware of: in his Glossary he included crux oððe staurus: rod (Bremmer 2010, p. 216; Zupitza 1880, p. 313). The Anglo-Saxon’s flexible attitude towards cross is extant as well in their writings and objects. Both Bede, one of the best scholars in early medieval Europe, and Ælfric perceived the Greek letter Tau as a cross (Brown 2007, p. 27; Lenker 2010, pp. 258 – 259, n. 59). An artist-scribe of the Lindisfarne Gospels rendered its carpet pages with various forms of the cross, i.e. the Latin cross, the Greek cross, the ring-headed or solar cross, and the tau cross, also known as the Egyptian cross or the cross of St. Anthony (Brown 2010, pp. 33 – 52, and Figures 1.1 – 5). Alongside the usual cross, various cruciform monograms like chi-rho ( Open image in new window ), tau-rho (staurogram), IX (∗) were employed as designs on coins (Blackburn 2007, pp. 185 – 199) and vessels (Owen-Crocker and Stephens 2007) or on charters as a pictorial invocation (e.g. British Library MS Cotton Augustinus ii 4 (Sawyer 1968, no. 114); British Library MS Cotton Augustinus ii 93 (Sawyer 1968, n. 163); British Library MS Cotton Vespasian A viiii, \(f\). 4r (Sawyer 1968, no. 745)). Coins also featured various cross designs: not only a vertical cross, but also a diagonal cross, and a cross with wedges in angles (Figure 2). Crosses were seen not only in the vertical plane, but also in the horizontal plane, in the cases of place-names (crossing) and the plans of churches (Rumble 2006, p. 29; Hinton 2010, p. 334, Figure 9.2). As is apparent from these examples, we should be aware of this visual culture of the Anglo-Saxons when considering the actual shape of the cross. In the discussion on the observational timing, N15a and N15b state “in medieval English (and Latin) the word after or æfter (in Latin: post) can also mean during (sunset)” (N15a, p. 239) and “Both the English after/æfter (Clark Hall 1960) and the Latin post (Niermeyer 1976) had the meaning of both our todays after as well as during/around [sic]” (N15b, p. 918), respectively. Consulting the dictionary by Niermeyer (1976), we find the entry of post on pp. 817 – 818. The English meanings given in Niermeyer (1976, pp. 817 – 818) are: “1. towards”, “2. after, in search of”, “3. with, by, at”, “4. in the hand of, in the power of”, and “5. deputizing for”. Despite our thorough search, we could not find the meaning of during or around in Niermeyer (1976) that N15b relied on. We also consulted the Dictionary of Medieval Latin from British Sources (Howlett et al.2009, pp. 2361 – 2362), which specialises in the usage of Medieval Latin in the British Isles and confirmed the entry of post does not give during or around but after, as in Classic Latin. Therefore, we conclude that the Latin variants of the Anglo-Saxon Chronicle seem to reject the interpretation of “during/around sunset” as suggested by N15a and N15b, as long as we read them literally. Limited philological insight might delude us to confirm their interpretation for æfter of æfter sunnan setlgonge/setlgange in Old English. As shown above, N15b (p. 918) cite Clark Hall (1960) for this interpretation as “during sunset”. This dictionary was first published in 1894 and has been reprinted for a long time with its title of A Concise Anglo-Saxon Dictionary. The entry of æfter of Clark Hall (1960, p. 5) shows its first meaning as “(local and temporal) after, along, behind, through, throughout, during”. At least, we can find during in this entry. Nevertheless, the entry states this meaning is both in the local and temporal context. As after sunset was used in the context of time, we need to extract the meaning in the temporal context. Moreover, Clark Hall’s dictionary is designed for learners, contrary to the scholarly dictionaries such as Bosworth–Toller and the DOE (Dictionary of Old English) as reviewed in Fulk (2009) and Rodríguez (2018). Therefore, we consider it would be more appropriate to consult these scholarly dictionaries for scientific discussions, rather than dictionaries for learners. The Dictionary by Bosworth and Toller (1921, p. 10) interprets this preposition as: “1. local and temporal dat. – after; post:” and “2. extension over space or time, – Along, through, during; \(\upkappa\upalpha\uptau\upalpha \), per”, in the context of time. As long as relying upon the dictionary by Bosworth and Toller (1921, p. 10), æfter with the meaning of during corresponds not with post but with per in Latin. Consideration of both the MS F (f. 48v.) and the Chronicle of Æthelweard (Campbell 1962, pp. 25 – 26) shows their Latin variants not as per solis occubitum/occasum but postsolis occubitum/occasum; hence the phrase æfter sunnan setlgonge/setlgange cannot be interpreted as during sunset. DOE no longer provides the meaning of during in its entry for æfter.4 When we see the entry of æfter as the preposition of “II.C. referring to time”, its meanings are given, respectively, as: “II.C.1. following (someone/something) in succession, succeeding, after”; “II.C.2. after an interval of, following the passage of (a period of time)”; “II.C.3. subsequent to a point in time (day, hour, season, etc. )”; “II.C.4. subsequent to an event”; “II.C.6. in combination with the demonstrative pronoun and (usually) the particle þe, forming a conjunction (only in prose, freq. in Or; cf. senses II.B.3 and II.E.7)”; “II.C.5. with dative, instrumental or accusative of the demonstrative pronouns (se, þes), forming an adverb phrase”; and “II.C.7. subsequent to and in consequence of, as a result of, because of”. The meaning of during is not even given. Other meanings through, throughout, or along are related not with “II.C. referring to time” but “II.A. referring to place (II.A.2 – 4)”. Therefore, again, the latest philological results on Old English favour not the interpretation during sunset but after sunset. In short, the philological results tell us to interpret æfter sunnan setlgonge/setlgange in Old English or post solis occubitum/occasum in Medieval Latin as after sunset literally and not to manipulate them to mean during sunset. The Alfred’s Law Code (El.25; Treschow 1994, p. 93) reads “Gif ðeof brece mannes hus nihtes 7 he weorðe Bær ofslegen, ne sie he na mansleges scyldig. Gif he siððan æfter sunnan upgonge. Bis deð, he bið mansleges scyldig 7 he ðonne self swelte, buton he nieddæda wære” which would be translated as “If a thief breaks into a man’s house by night and he is slain there, he is not guilty of homicide. If he does so after sunrise, he is guilty of homicide and he himself shall die, unless he acted out of necessity” (Treschow 1994, p. 93). If we confine æfter sunnan upgonge (after sunrise) as some short time after sunrise, the code cannot cover the whole day together with nihtes (by night). Therefore, it would be more realistic to understand after sunrise in this code as covering the whole day time after sunrise. MS F, f. 51r. .dcccvi…. Old English Version: Eac on ðys ylcan geare,.ii. nonas Iunii, rodetacn wearð ateowe[\(d\)] on ðan monan anes Wodnesdæges innan ðare dagenge. An eft on ðis geare an kalendas Septembris an wunderlic tre[\(nd\)]el wearð ateowed abutan ðare sunnan…. English Translation: [Swanton 2000, p. 59]. MS F 806. [As E]…. Also in this same year, on 4 June, the sign of the cross appeared in the moon one Wednesday at the dawning: and again in this year, on 30 August, an amazing ring appeared around the sun. Latin Version: Hoc anno etiam, .ii. nonas Iunii, luna quarta decima, signum crucis mirabili modo in luna apparuit feria .v. aurora incipiente, hoc modo #. Eodem anno, .iii. kalendas Septembris, luna xii., die dominica, hora. .iiii., corona mirabilis incircuitu solis apparuit. (v. 8, p. 59). English Translation: Also in this year, on 4th June, the 14th day of the Moon, the sign of the cross in a remarkable fashion, appeared in the Moon on Wednesday in dawn, like this #. In the same year, on 30 August, the 12th day of the Moon, on Sunday, at the fourth hour, a wonderful crown appeared around the Sun. The halo records in 806 are found only in MS F, whereas parallel records are not found in other manuscripts. The reason for this isolated attestation is due to the fact that the scribe of MS F had access to a manuscript based on a now lost Latin chronicle from Winchester, which in turn was possibly derived from a continental source. In particular, the text and the drawing of a cross appear in exactly the same way as in two continental annals called Annales Sancti Maximi Trevirensis (Pertz 1841, p. 6; \(c\). 840) and Annales Laudensis et Sancti Vincentii (Pertz 1888, p. 1294; \(c\). 875) (Baker 2000, pp. xlvi – xlvii, 59). Therefore, the observers and the observational sites were probably different between the records in 776 (observed in Britain) and 806 (observed in Continental Europe), and the drawing in the ASC MS F itself is also not an original one based on the original observation but a copy from continental annals via the lost Winchester Chronicle. Here, MS F (f. 51r.) explicitly reported the existence of the Sun and the Moon as “a cross appeared in the moon” and “a wonderful crown was seen around the Sun”. The observer who contributed to the MS F seemed aware of the relationship between the Sun or Moon and a halo display. On the other hand, as for the red cross in 776, the observers described this event as read Cristes mel (red sign of Christ) and related this phenomenon neither with the Sun nor with the Moon in any of the variants. The previous eyewitness records are consistent with modern all-sky auroral observations. 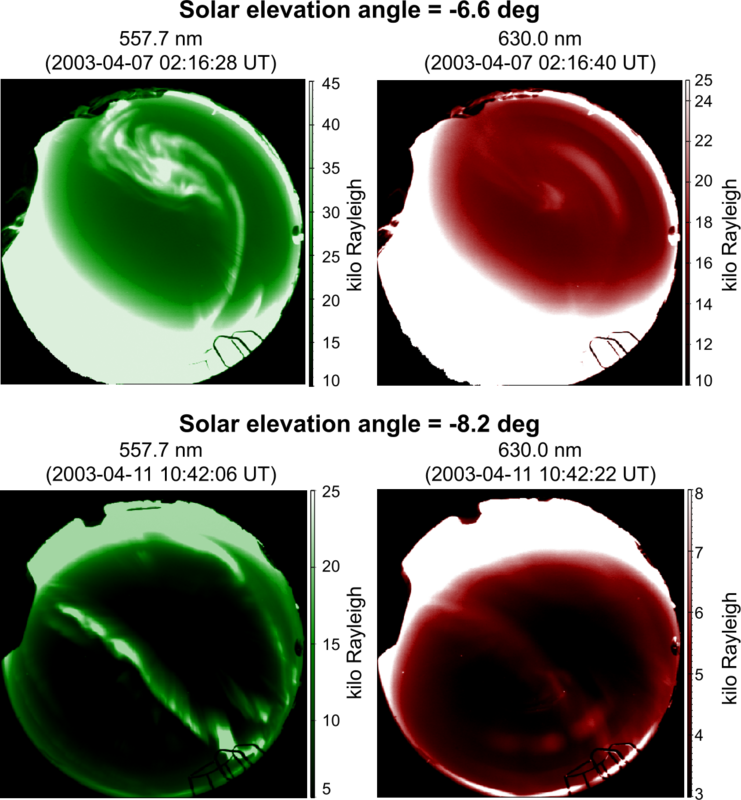 Figure 8 summarises all-sky auroral images taken at the South Pole Station (S90°) (Ebihara et al.2007). The magnetic south (magnetically poleward) is to the left-bottom direction. Sunset occurs for the first time in each year at the South Pole Station around 21 – 22 March because this station is on the Earth’s rotation axis. At 02:16 UT on 7 April, the solar elevation angle is −6.6°, which refers to nautical twilight. The scattered sunlight occupies the large area, but the auroral structures can be distinguished. At 10:42 UT on 11 April, the solar elevation angle decreases to −8.2°, which also belongs to the nautical twilight. The scattered sunlight is weakened. The auroral structures are clearly visible. All-sky auroral images at the South Pole Station taken at (top) 02:16 UT on 7 April 2003 and (bottom) 10:42 UT on 11 April 2003. The left panels show the images at 557.7 nm (green) and the right ones show the images at 630.0 nm (red). The auroral image data from the South Pole Station is available at the website: http://www.southpole-aurora.org . Therefore, these images imply that an auroral display is visible even during twilight if its brightness is sufficient. Ebihara et al. 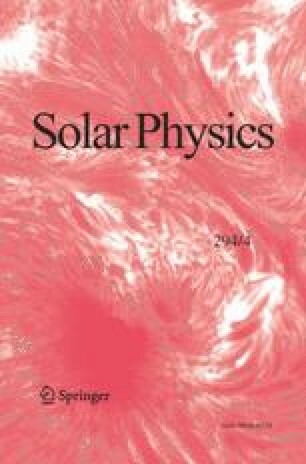 (2017) consider the cause of auroral displays with extreme brightness (IBC, class IV) in low to mid magnetic latitudes as being due to the precipitation of high-intensity low-energy electrons. This evidence shows that disproving the possibility of an aurora because of “the timing after sunset usually means twilight” (criterion 1 in N15a) contradicts the observational evidence. Dammery, R.J.E. : 1991, Law-code of King Alfred the Great. Doctoral thesis. DOI.